2. 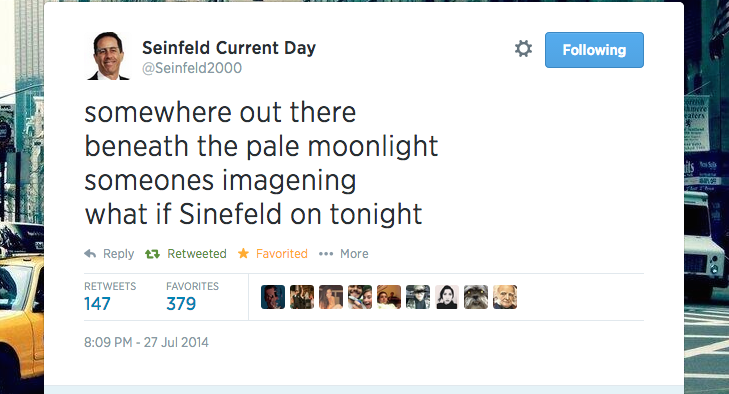 Let’s just get this out of the way: Yes, @Seinfeld2000 has crazy spelling. He, as a sane person who “plays” this character, knows how to spell. The “character” does not, and that is part of his nutso charm. This constitutes the major barrier of entry into this world; if you can hang with the crazy spelling, and you have a certain sense of humor, great rewards await you. If not, this probably isn’t for you. That’s okay, because we fans have this kind-of indie-band possessiveness over @Seinfeld2000. We don’t want him to go too mainstream. Because I’m really into it, I see it as a kind of literary voice. There’s a consistency to it, and it gets you into the @Seinfeld2000 way of thinking. 3. The result is greater than the sum of its parts. While @Seinfeld2000 is, essentially, a sane person pretending to be a crazy person mocking a Twitter feed about Seinfeld characters in modern situations, it has become more of a statement on Internet culture. It sends up the idea of Twitter parodies, of viral phenomena, of Internet “voice” (misspelling, constant mocking), of free access that doesn’t distinguish the spellers from the non-spellers. I see it as part of Weird Twitter, an artsier concept than the term implies. KnowYourMeme has a great definition: “a loosely connected group of Twitter users who are known to experiment with spelling, punctuation and format for humor or poetry.” For an amazing journey through Weird Twitter, read Susan Orlean’s New Yorker piece on Horse_eBooks. 4. Okay, now you’re ready for the deeper stuff. @Seinfeld2000 was not content to merely dabble on Twitter. He’s done several big projects since, envisioned as (very elaborate) PR for the feed. One of his earliest feats was a 16,000-word e-book that imagines the New York Four holding up the Apple Store on Fifth Avenue at gunpoint. Barack Obama and Lena Dunham get involved. As you can guess, it’s very hard to read at first because of the constant messed-up grammar and spelling. But like most literary voices, once you get used to it, your brain adjusts, and it’s fine. It also happens to be dark (the Kramer character is a massive racist, George did time for Susan’s murder, Elaine just got fired from BuzzFeed) and hilarious. The bad news: Warner Brothers went after @Seinfeld2000 and forced him to stop selling the book. The good news: This means it’s available for free on Gawker. Right around this time, @Seinfeld2000 gained enough momentum to garner fans who weren’t even necessarily that big on Seinfeld, as this book review attests. 5. If you can’t spare the time for a 16,000-word e-book, there’s this video(ish) rendition of @Seinfeld2000, SeinQuest2000. It’s only 13 minutes. 6. @Seinfeld2000 actually has his own freelance writing career. He wrote a few things for BuzzFeed, of all places. He also interviewed musicians, in character, for Vice.com. 7. He launched a YouTube channel, highlights of which include scenes from George and Susan’s relationship set to Arcade Fire’s dramatically ominous “Here Comes the Night Time” and the Seinfeld theme song slowed down 1200 percent. 8. The New York Times persuaded @Seinfeld2000 to reveal his true identity in a profile earlier this year. He’s Jason Richards, a Canadian 31-year-old writer and TV producer. 9. His famous and talented followers have collaborated with him on a number of spin-off projects that got lots of online attention. The Junior Mint game features the work of Pippin Barr, a video game artist, and a version of the Seinfeld theme sung by Vampire Weekend’s Ezra Koenig. Seinfeld emoji are actually available as an app.